Announcement Handmade clothing and accessories, patterns and much more. Fall Winter fashion knit, crochet pom pom beanie hats, scarves, cowls, leg warmers. Cute Christmas gifts for men and women. Handmade with love in USA in smoke free house. 100% handmade clothing and accessories, based on original designs by Accessodium. Handmade clothing and accessories, patterns and much more. Fall Winter fashion knit, crochet pom pom beanie hats, scarves, cowls, leg warmers. Cute Christmas gifts for men and women. PATTERN to make Crochet Poppy Flower. Photo Props Handmade Headband. Instructions how to make flower headband. 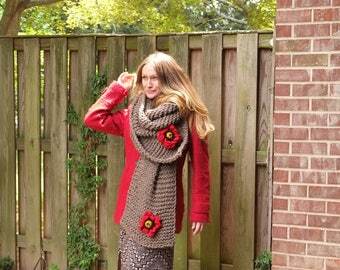 PATTERN For Chunky Scarf With Poppy Flower. Bonito patrón. Parece sencillo. Lo haré muy pronto! I love to spin, if I have time, I spin wool yarns to make winter items, such as hats, scarves, gloves etc. Very Welcome to my Etsy shop! When I was young I loved to watch my Granny knitting, for me it was so magical and so natural, and I knew when I grew up I would be able to make various kinds things for myself as good as my Granny! 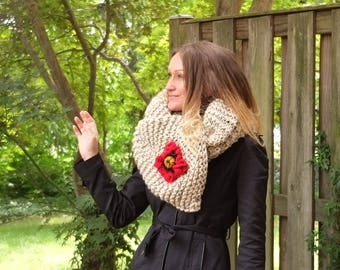 For many years I used this skill to make beautiful knit and crochet things for myself, my family and my friends, recently I decided to share it with the World on Etsy :) I love beautiful accessories, knit and crochet clothing and I love to create all those beautiful things! I have learned that we are all different and I would like to make my shop a reflection of this diversity. I hope you will find something you will love! Thank you so much for shopping with Accessodium! Hi, my name is Tanya, I am a part time yoga instructor and I love to create little things for my Etsy shop. Welcome to my little shop! I want you to be satisfied with your purchase, but if at some point product did not meet your expectations I will be happy to exchange or you can return your order within one week after delivery. I can only accept items that are unused, unwashed and unaltered. Refund will be send back to your account after I will receive the package. Please note - shipping cost is not refundable. I ship worldwide. All items are sent through the First Class or Parcel USPS mail with tracking number. All items are carefully packed in order to avoid any accidents which could result in damaging the products.